This dish is one that every cook should have in their repertoire. It’s easy, feeds 3-4 people, and best of all it’s really cheap to make! The other great thing about roast chicken is that you can stuff it with whatever you have on hand!Yes! Depending on what you decide to stuff the chicken with it can change the flavor of the meat drastically and it’s like having a whole new recipe every time. Also, you can use leftovers to make chicken salad! The crispy salty skin of the chicken goes great with the juicy meat. The potatoes, which are cooked along with the chicken, soak up the drippings and man, oh man, it’s just a little piece of heaven on your plate! This dish is sure to impress any guest! Preheat your oven to 425 degrees. 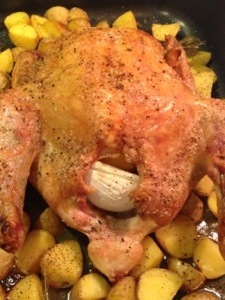 Take your rinsed and patted dry chicken and place in a roasting pan. I don’t have a roasting rack so I just laid it in the pan. This works just fine. If you have a roasting rack then use it if you desire. Liberally salt the inside of the bird and stuff with the onion, lemon, garlic, and herbs. Rub olive oil all over the outside of the bird and salt and pepper liberally. Now pop it in the oven! I had a 4.5 lb. bird which took about an hour and 15 minutes to roast. 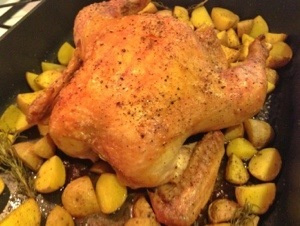 About 45 minutes in, place your potatoes around the bird, throw in a few sprigs of rosemary and place back in the oven. Roast until potatoes are soft and the meat on the thickest part of the chicken thigh (don’t touch the bone) has an internal temperature of 180 degrees. I love a roast chicken. I’ve recently been challenged to cook a roast chicken to a different recipe each week for a year and write a blog about it. I think it’s going to become a bit of a challenge after several weeks. Loving the challenge so far though and looking forward to coming up with new ideas. That’s interesting and definitely challenging. It will be interesting to read! Thanks for the visit! That’s a great idea, Melody! I’m definitely not as disciplined and organized as you, haha :). I’ll have to try that!